Former Ireland international Andrew Trimble has predicted that Rob Kearney will continue to start ahead of Jordan Larmour for this month's November internationals. Kearney has scored just one try in 79 games since September 2014 and is facing increasing pressure to hold onto his spot at full-back in light of Larmour's spectacular hat-trick against Italy last weekend. Trimble, who played with Kearney for 10 years with Ireland, predicts that Ireland head coach Joe Schmidt will stick with the former Lions full-back and that he will place a lot more emphasis on the finer details of the position than the more obvious highlight plays. "He's closer than ever but it's still not that close I don't think," said Trimble on the latest episode of Baz and Andrew's House of Rugby. "He could go a great job against the All Blacks but he might not be able to do a Rob Kearney job. I think it's still a big step up. You can't compare playing a second-string Italy side in Chicago to the All Blacks in the Aviva. It's not the same thing. "But he's done everything he can possibly do to climb the ladder and be as good as he possibly can be but still Joe likes Rob Kearney. Joe likes somebody where he knows what he's going to get. "He's going to be good in the air, he's going to kick the ball well, he's a guy that can appreciate space in the backfield, he's going to do basics really, really well, better than anyone in fact, and I think that there's a lot to be said for that." Trimble was not put off by Kearney's try scoring drought and added that the 32-year-old has faced pressure before concerning his position but that that has not prevented him from holding on to the Ireland no.15 jersey in the past. "He's been in this position before where he's got a bit of pressure," added Trimble. "Guys have talked about other young fellas coming through with a bit of x-factor. He's always stepped up and taken the next opportunity that has come his way. He just performs and we're so used to him performing. 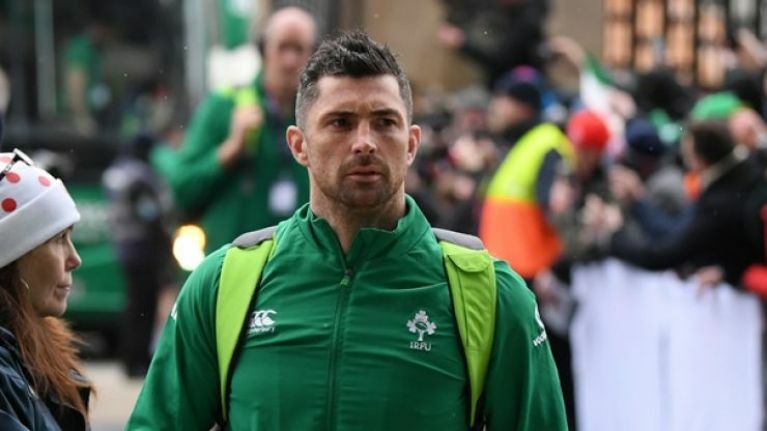 "I think Joe cares - not that he doesn't care about try scoring - but he cares an awful lot more about execution under pressure, getting the ball, contesting, making tackles in the backfield, making correct decisions with ball in hand - all those decision that contribute to a big test match performance and that's the stuff that Rob Kearney does well. "Jordan Larmour is an incredible athlete, he's so talented, and I think he's put himself as close as he can to Kearney but Joe knows what he's going to get from Kearney at the test match level."